Summary: Half-human, half-angel, Meridian Sozu has a dark responsibility. Thanks for hosting these giveaways! Please enter me! Oh please include me! I've been wanting to read this for a long time! Would love to be entered, thanks for all the amazing giveaways!! Wow have not seen this book before but it looks great! I've been wanting to read this one for a long time. I would really love to win! Thank you for the great giveaways. I'd love to read this one. Enter me for this one too please. This one sounds good. Thanks for hosting these fantastic giveaways! This book sounds so awesome! Please, please, Please enter me! Entering these have consumed my entire morning... But in a good way. Thank you for hosting this! Been wanting to read this for awhile. I would like to enter this giveaway! This looks great. Thanks for the awesome giveaways. 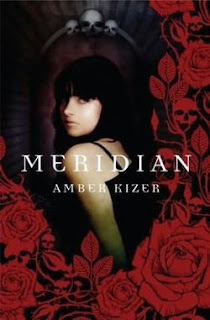 Meridian sounds like a really good book. This is just fantastic ! This has such a pretty cover. I would love to win this. Thanks for the chance! looks interesting! count me in. I would love a chance, thanks! I would love to own my own copy of Meridian. It's a really great book. Thansk so much for this! I've been meaning to check this book out. Thanks for reminding me and for this giveaway, of course. Please include me in the contest please! Haven't read this and I really want to! please count me in - I've heard great things about it! Thanks for the giveaway! This sounds really cool! Sounds really good. Thanks for the giveaway!